Are you wondering how to get started with my lessons? Are you a little overwhelmed by the choices of lessons in our online shop? It’s actually simpler than it seems. You will find a chart of our lessons near the bottom of this page that illustrates our offerings in an easy to understand graphic. There, you will also find a chart showing skill level for each lesson. 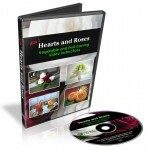 We have an introductory lesson called Hearts and Roses, a 101 Course for Beginners, a 201 Course-Beyond the Basics, and a 17 Lesson Collection that includes all of these. The lessons in each of these groupings are available individually. We also offer a Portrait Carving Course. All of the above lessons are available on DVD. When you order DVDs you also get online access so that you can start learning right away before your DVDs arrive. Our Courses and our most popular individual lessons are available in on ONLINE ONLY versions. In addition, we offer Ray Villafane’s 3D Pumpkin Carving Tutorials – available on DVD only. The following questions and answers should help you find what you want based on your specific needs and desires. Is vegetable and fruit carving brand new to you? Do you want to see what our lessons are like? For free? You can get a free sample lesson by signing in to the form on the right side of this page that offers a Step-by-Step Video Lesson. We will send you a free lesson right away. This will allow you to see what our lessons are like. When you sign up for your free lesson, we will also sent you tips, ideas and mini-lessons from time to time. Do you want to start carving but are not ready to get tools? Then I recommend that you start with our Hearts and Roses video lessons. You’ll learn 4 different carving types of carvings that don’t require any special tools. All you will need is a sharp, pointed paring knife. You will impress your friend (and yourself!) with the beautiful carvings that you will make. Want to learn a wide variety of carving techniques? Then you will love our Vegetable and Fruit Carving 101 Course for Beginners. The course starts with easy projects and builds your skills until you begin carving melons in the Thai style. You’ll get a comprehensive set of lessons and you’ll have carving success right away. Don’t let the name fool you. Although the course is designed for beginners, many people with some carving skills have learned new things from this course. You may join any of the lessons in the 101 Course individually, but you’ll get the the best value when you join the whole course. Are you looking for intermediate lessons? Do you want to focus on learning how to do Thai style melon carving? If so, you can start with Carving Watermelons – Roses, Buds and Leaves. 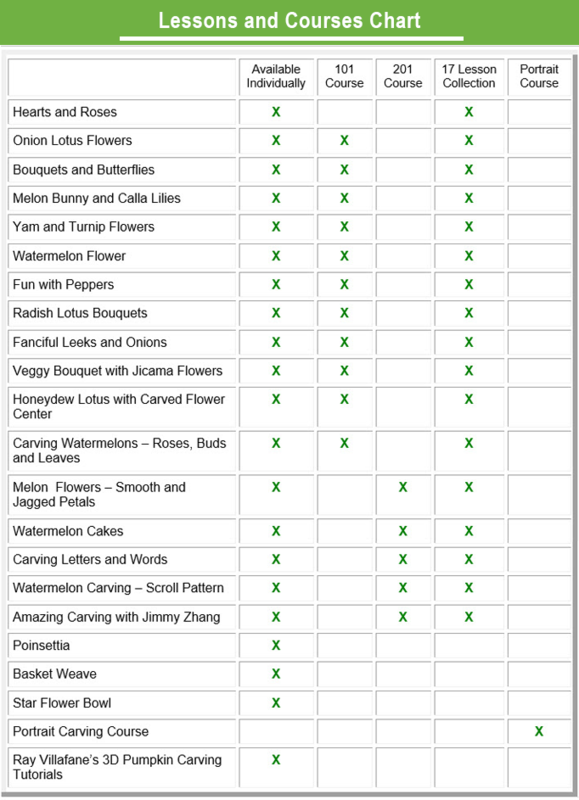 It is an excellent primer for learning to carve 3 dimensional flowers into watermelons. The techniques that you will learn can be used to carve other melons, squashes, mangoes, papayas and pumpkins. Carving Watermelons – Roses, Buds and Leaves is lesson #11 in the 101 Course. 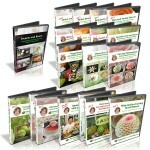 The next lessons that you will want after Roses, Buds and Leaves is my Melon Carving – Smooth and Jagged Petals lessons. They pick up where the Roses, Buds and Leaves lessons leave off. After that, I recommend the Scroll Pattern Lesson which is designed for those who are ready for more intermediate/advanced carving. Carving Letters and Words #1 and #2 although not specifically Thai Style, shows techniques that are fun to use in combination with the flower patterns taught in these lessons. Do you already know how to do the carvings taught in my 101 Course and are looking for something more? Then I recommend the 5 lessons that I created to expand your skills after the 101 course. They are Carving Melons – Smooth and Jagged Petals, Carving Letters and Words, Watermelon Cakes, Watermelon Carving Scroll Pattern, and Amazing Carving with Jimmy Zhang. You can join these lessons individually or take advantage of savings by joining them all in the 201 Course – Beyond the Basics. You can find all of the lessons that are not included in the 101 Course by clicking here. If you are a beginner and want to jump right into one of these lessons prior to doing the 101 Course, I recommend Carving Letters and Words #1 and #2, Watermelon Cakes, and/or Amazing Carving with Jimmy Zhang. These 3 lessons start with beginners lesson and proceed to intermediate. For the other 2, Carving Melons – Smooth and Jagged Petals and Watermelon Carving Scroll Pattern, I recommend learning from Carving Watermelon – Roses, Buds and Leaves first. Are you looking to make carvings for a specific event? Do you have wedding, birthday, graduation or other event coming up for which you want to carve words or designs onto watermelons? Then you will love our Carving Letters and Words video lessons. You’ll learn exactly how to carve personalized melons that will surprise and delight your guests of honor. The techniques learned in these lesson can also be used when carving graphic designs and for carving pumpkins, too. Do you have birthday celebration coming up? The watermelon cakes that you will make after learning from my lessons, Watermelon Cakes #1 and #2 will be the hit of the party. Not only are watermelon cakes surprisingly unexpected and beautiful, they are perfect for those who like to eat healthy. It the Watermelon Cakes #1 and #2 lessons, you will find beginner, intermediate and advanced lessons. Would you like to carve a recognizable portrait for a guest of honor? If so, then our Portrait Carving Course is perfect for you. You will learn the secrets that will make carving a recognizable portrait easy, even if you have no talent for drawing. The Course starts with easy 2 toned portraits. Then it progresses to intermediate 3 toned portraits and advance multi-toned portraits. Your friends will be amazed at your portrait carvings! 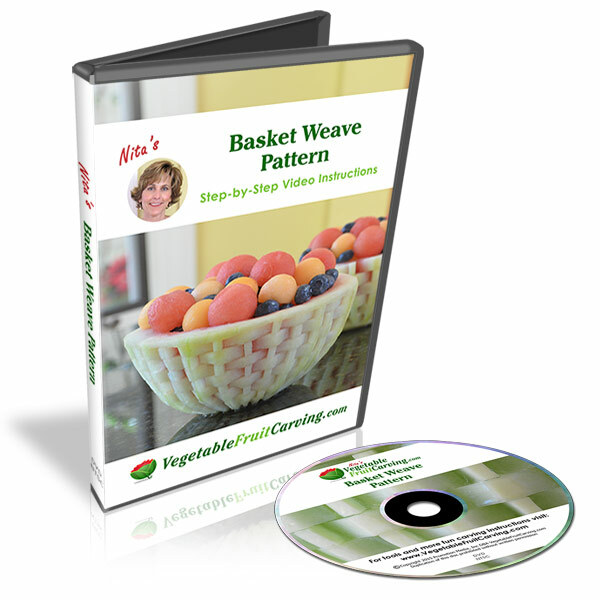 Would you like learn something different than what Nita teaches? If you have already done my lessons and you are looking for something different, then check out our lessons, Amazing Carving with Jimmy Zhang. I created these lessons to give my students something different after they learn from my lessons. Amazing Carving with Jimmy Zhang starts out with 2 easy bouquets and moves on to carrot flowers that require some practice. But once you get the technique down, you can carve lots of flowers quickly. These full vegetable bouquets are taught in these lessons. You can find all the lessons in our online shop that taught by artists other than Nita by clicking here. Why not get all of the lessons? Well almost all. 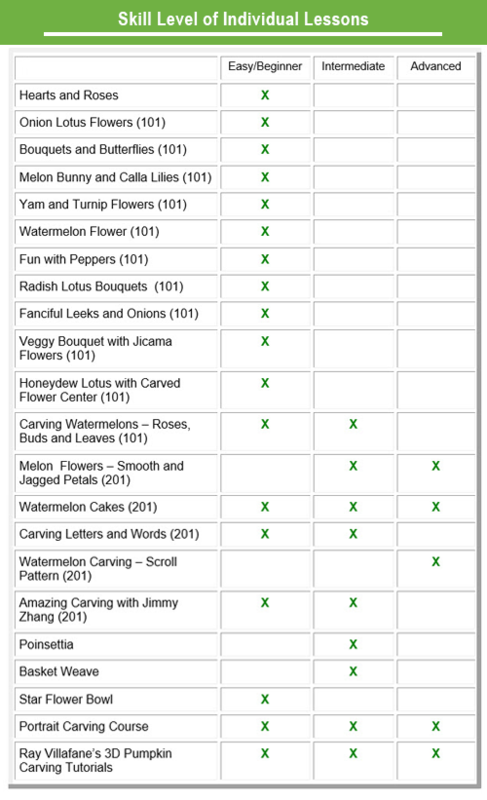 Nita’s 17 Lesson Collection gives you all of Nita’s lessons including Amazing Carving with Jimmy Zhang. You will be taking advantage of substantial savings when you get the 17 Lessons all at once. Are You a Hobbyist or a Culinary Professional? Are your a caterer, chef or other culinary professional? Any of my lessons are suitable for wowing your clients and dressing up your platters and buffet tables. Many culinary pros have dramatically improved the visual appeal of their food displays by applying what they have learned from my lessons. You can see some of their stories and photos throughout my blog but specifically in the section about Pro Carvers’ Stories. 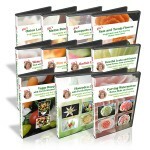 You will find more of the quicker, easy to make garnishes in my 101 Course. The carvings taught in my 201 Course will elevate your food service displays even more. Your buffet tables with your carvings will be far more memorable that your competitors’. The guests will have their cameras snapping away (which can serve to bring you new clients when they share their photos). Are you a home cook or hobbyist who likes to entertain with flair? All of my lesson will have you making carvings that will WOW your guests. You will become the talk of your community. If you want to see the carvings and stories of some of my carving students, you can look in Student category of the Carvers’ Stories and Photos section. One of the things that I hear most often from student/customers is how they love hearing all the ooohs and aaahhs. Are you planning to start a fruit carving business? Then you will want to learn from all of the lessons. The 17 Lesson Collection is the best value. You will save a bundle joining the 17 Lesson Collection as compared to joining the lessons individually or as 101 and 201 Courses. You will find stories and photos from people, like you, who have had fun learning from my lessons throughout the section of my blog named, Carvers’ Stories and Photos. You can look in both the Student category and the Pro Carver category because many of my student/customers who started as students, have since become professionals. If your gift recipient is a new to fruit carving, Hearts and Roses would be good lesson that requires no special tools. If you would like to give a more substantial gift, the 101 Course would be great. I’ve even had people purchase everything in my shop to give as a grand gift. It you want to give lessons with corresponding tools, the Corrugated U-Cutters would go well with the Yam and Turnip Flowers lessons and the Watermelon Flower lesson. These 3 items together make a great gift. Another very nice gift for a or intermediate carver is the Thai Pro knife along with the lessons, Carving Watermelons – Roses, Buds and Leaves. The Watermelon Cakes #1 and #2 go well with the Corrugated U-Cutters and the Kom Kom 3 knife set. The Watermelon Cakes lessons have something for every skill level- beginner, intermediate and advanced. When you are looking at lessons in my online shop, you can click the ‘Additional Information‘ tab on any lesson page to see what tool or tool set is used in that lesson. Or, can see which tools go with which lessons in the charts that you can find at the bottom of the page named ‘Which Tools are Best for You‘. Want to carve ghoulish 3 dimensional faces on pumpkins? 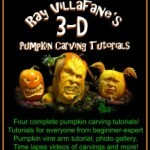 Then you will love Ray Villafane’s 3D Pumpkin Carving Tutorials. In it, you will find something for every skill level from beginner to advanced. Ray Villafane is super talented pumpkin carver and a full time professional toy sculptor. He was also an elementary school teacher in a past career. In his video lessons, Ray clearly teaches his art so that YOU CAN make successful 3D pumpkin carvings. Want to carve recognizable pumpkin portraits? Nita’s Portrait Carving Course will show you everything you need to know to carve very recognizable portraits of your friends, family, celebrities, guests of honor, or anyone else. If you can trace, you will be able to surprise and delight your guests with fabulous pumpkin portraits. You will also learn how to carve watermelon portraits in the Portrait Carving Course. You will be able to carve portraits all year ’round. Want to carve pretty pumpkins? You can use the carving techniques taught in the following lessons to carve pretty pumpkins. Want to learn carvings to make with your new tools? Have you purchased tools and now want to learn to do carvings using those tools? Check out the “Which Tools Are Best for You” page where you will see which tools are used in which lessons. That might help you decide which lessons to get first. What tools are needed with which lessons? 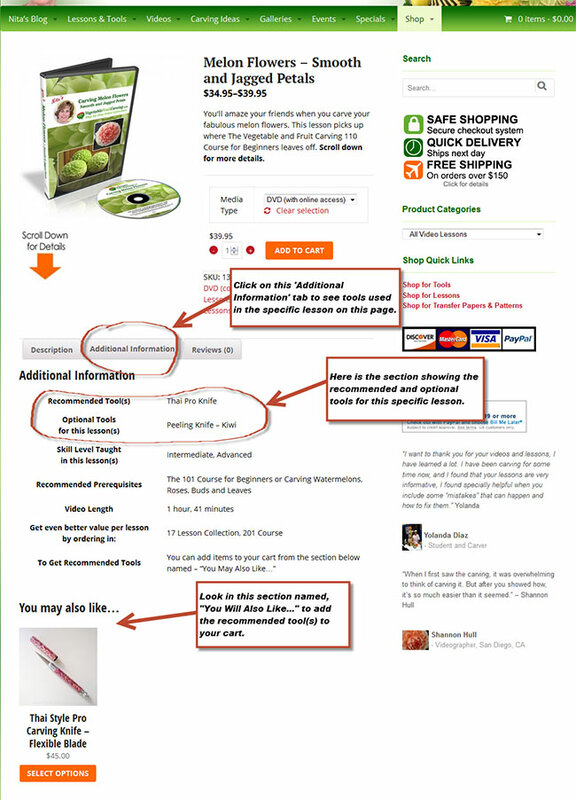 When you are in the shopping cart looking at any lesson or course, look for the “Additional Information” tab and click on it. There you will see the tools recommended for each lesson. 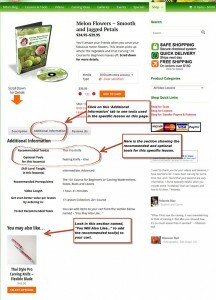 The screen shot below will show you where to find the ‘Additional Information’ tab. You can also check out the “Which Tools Are Best for You” page where you can see charts of which tools are used in which lessons. Which Lessons are the best value? Which are the most popular? The pricing the lessons is structured so that the more you join at once, the more you save per lesson. In other words, the price per lesson is less when you join one the 101 Course as compared to joining Individual Lessons of the 101 Course. You will save per lesson when you join our 201 Course versus joining the individual lessons in the 201 Course. You will save even more per lesson when you join our 17 Lesson Collection than if you join the 101 Course now and the 201 Course separately. You will get the best value when you join the 17 Lesson Collection. Amazing Carving with Jimmy Zhang. Are you located in another country and are concerned about shipping? You can join the ONLINE ONLY versions of our lessons and start learning right away. Our Courses and many of our lessons (but not all) are available in an ONLINE ONLY version. You can see all of the lessons available in ONLINE ONLY versions by clicking here. By the way, we DO ship all over the world. So, you can have DVDs and tools shipped to you. Why Choose DVDs vs. ONLINE ONLY lessons? And visa versa. Are you excited to start learning NOW? Can't wait for your DVDs to arrive to start learning? We also offer ONLINE ONLY versions of our most popular lessons. I hope that these questions and answers have helped you to decide where to start. If you still have questions, check out our Frequently Asked Questions page. Or, you can contact us. Oh, and by the way, you can see which tools are needed for each lesson by looking in the ‘Additional Information‘ tab on each product page in the shop. Here is the chart that shows which lessons are in which courses. To see which tools are used in each lesson or course, visit our page, ‘Which Tools are the Best for You‘.